Got a fridge full of leftover turkey? Maybe some cranberry sauce? 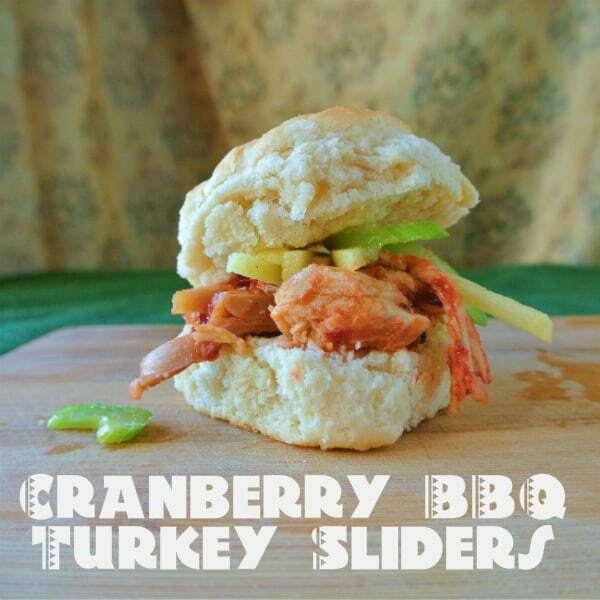 Then you are two steps closer to make this wonderful cranberry BBQ sauce turkey slider, that Giada made on a recent episode of her show, Giada at Home. I am a big fan of fruity BBQ sauces. This year only I have made BBQ sauce with cherries, peaches, and apples. Cranberries seems like a good ideas as well. 1. You can use whatever bread/rolls you like for the sliders. I choose some biscuits I just happened to have on hand. Leftover dinner rolls are a good choice as well. 2. The slaw recipe calls for Granny Smith apples. Pick any apple that is crisp and has some tartness to it. I went with my favorite tart baking apple, the Northern Spy. 3. I use the leftover jellied cranberry sauce that I had in the fridge. I would have liked to try Giada’s recipe but 1/2 cup of maple syrup isn’t exactly cheap. 4. For the BBQ sauce, the recipe calls for Dijon mustard. I was out, so I used brown mustard instead. Use whatever mustard you have on hand and that you like. 5. Cook the sauce until it’s to your desire consistency. It may take more than 5 minutes in your kitchen. Go by feel here not time. 6. I choose not to mix the turkey directly with the sauce. I prefer to give people the choice of how much sauce they want on their turkey. This beats the plain old turkey sandwich any day. The BBQ sauce was finger licking good. It went with the turkey very well without being overpowering. The slaw I am ok with doing without, since I am not a big celery fan (the texture does not please my palate, but it was easier to handle as the celery is shaved thinly. My wife LOVED the slaw. She thought it added some freshness to the slider.